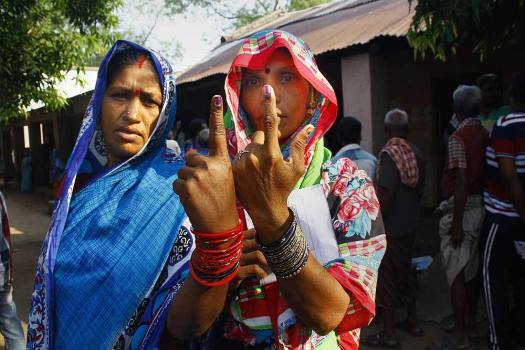 Voters show their finger marked with indelible ink after casting vote for the second phase of the general elections, at a polling station, Panchabhuti in Ganjam district. 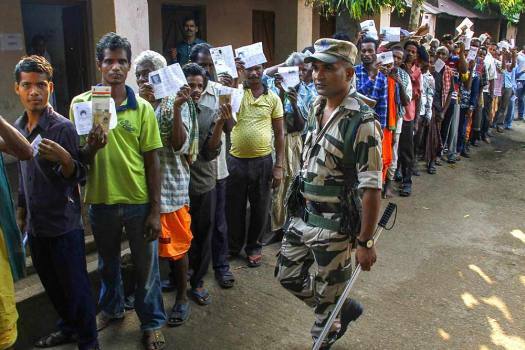 A security personnel stands guard as voters queue to cast their vote during the second phase of general elections, at a polling station, Panchabhuti in Ganjam district. 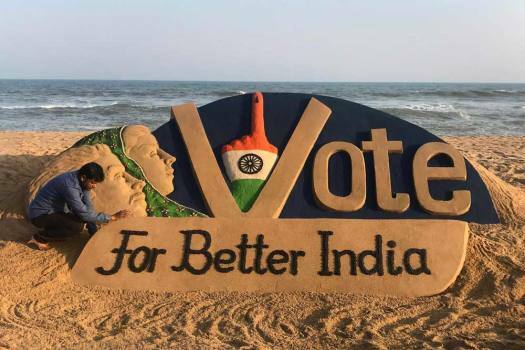 Sand sculptor Sudarsan Pattnaik creates a sand sculpture to raise voting awareness on the eve of the second phase of Lok Sabha elections, at a beach in Puri. 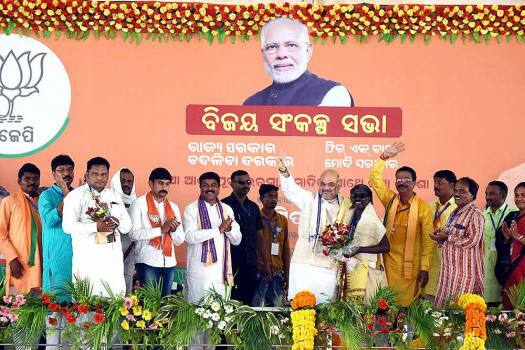 Bharatiya Janata Party (BJP) national president Amit Shah with others during a public meeting for the upcoming general election, at Bargarh. 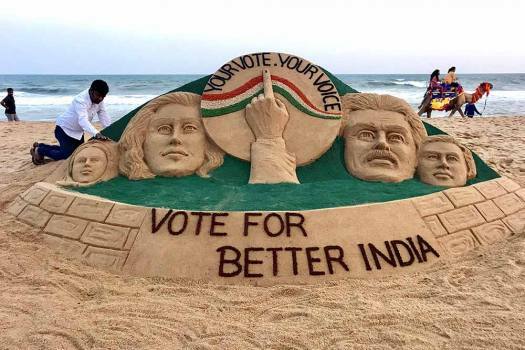 A view of a sand sculpture by artist Sudarsan Pattnaik, to aware voters, at Puri beach, in Odisha. 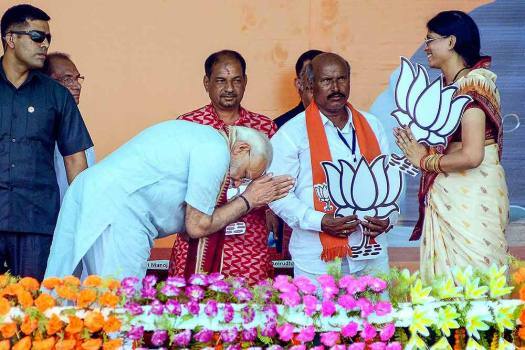 Prime Minister Narendra Modi greets BJP candidate Rita Rani Bagarti during 'Vijay Sankalp Samavesh' public meeting ahead of Lok Sabha elections, at Bhawanipatna in Kalahandi. 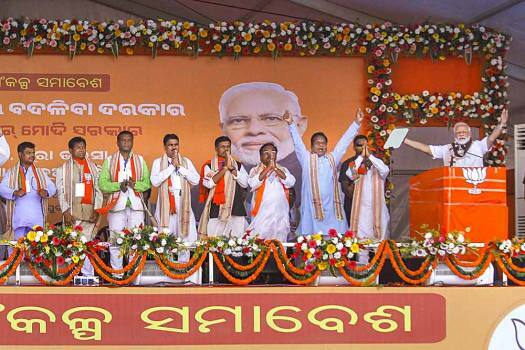 Prime Minister Narendra Modi addresses during 'Vijay Sankalp Samavesh' public meeting ahead of Lok Sabha elections, at Bhawanipatna in Kalahandi. 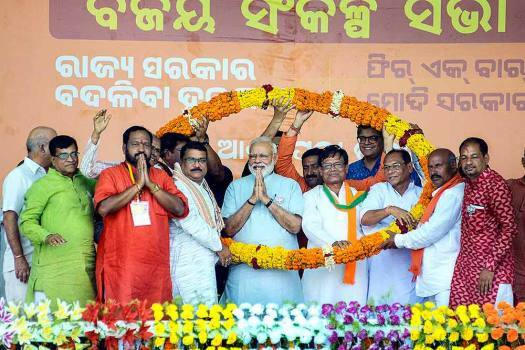 Prime Minister Narendra Modi along with party leaders during 'Vijay Sankalp Samavesh', a public meeting ahead of the Lok Sabha elections at Jeypore, in Koraput district. 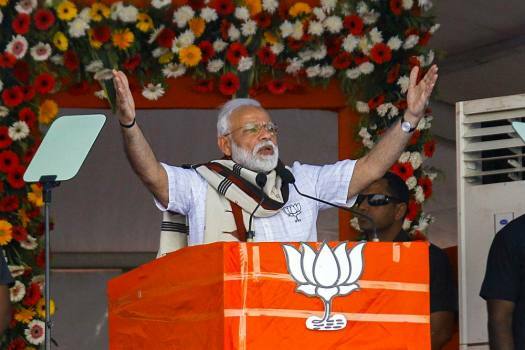 Prime Minister Narendra Modi addresses during 'Vijay Sankalp Samavesh', a public meeting ahead of the Lok Sabha elections at Jeypore, in Koraput district. 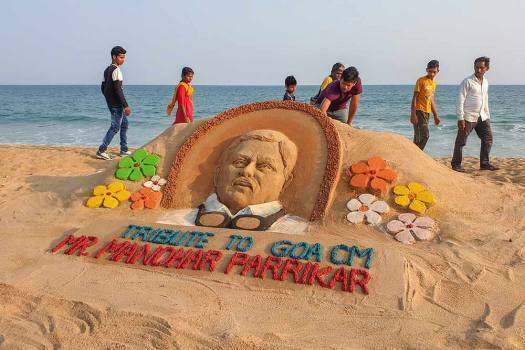 Sand artist Manas Sahoo makes a sand art to pay homage to Goa's Chief Minister Manohar Parrikar, who passed away battling pancreatic ailment yesterday, in Puri. 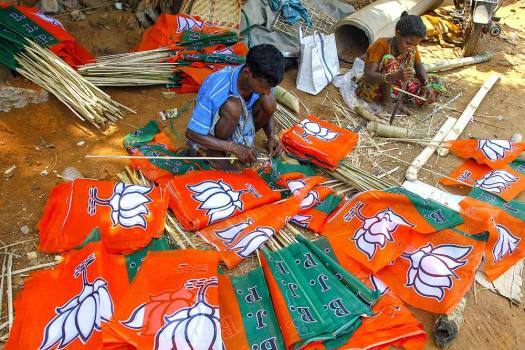 Workers prepare BJP party flags ahead of General Elections 2019, in Bhubaneswar. 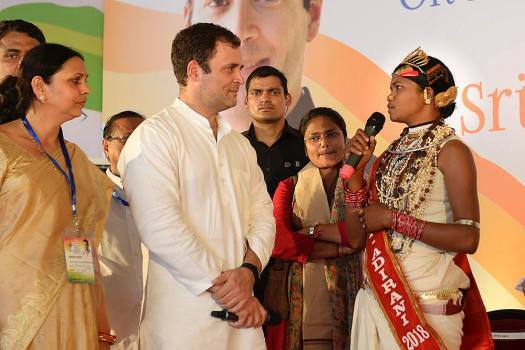 Congress President Rahul Gandhi interacts with a villager at a public meeting in Jeypore area of Koraput. MP Baijayant Jay Panda who recently joined Bharatiya Janata Party (BJP) is greeted by state party leaders during a welcome ceremony, in Bhubaneswar. 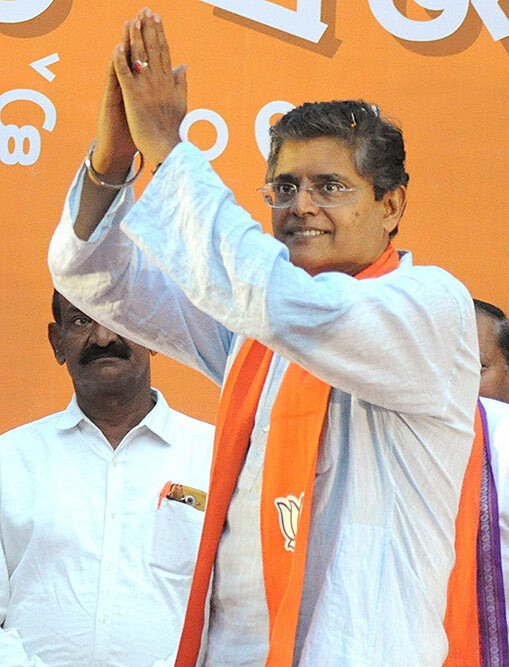 The case against Jay Panda is most likely to die a natural death. 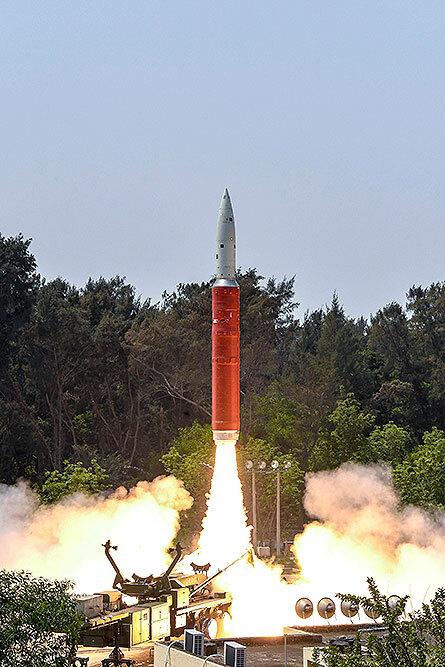 The Odisha government, however, would be happy that the limited purpose for which it was lodged in the first place has already been fulfilled. Bonds Beyond The Red Tape: Recent stories of the public’s love for some of the government officers stand as proof. Justice C R Dash of the HC, who is monitoring the police investigations of all the criminal cases arising out of the police-lawyer standoff, proposed a compromise formula to end the two-and-half-month row. 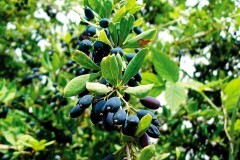 What’s Special About Ramlilas Of Northeast And Odisha? The main reason why Patnaik’s declared revulsion at the BJP’s communal politicking during and after the violence in Kandhamal is met with scepticism is that his pluralist, secular conscience seemed to have been hibernating during the Gujarat pogrom in 2002. And this is reasonable: horrible though Kandhamal was, it was, at best, Gujarat in miniature. So why was Patnaik straining at a gnat, having swallowed the camel? There’s a straightforward answer to that question. For Patnaik, the pogrom of 2002 happened elsewhere. 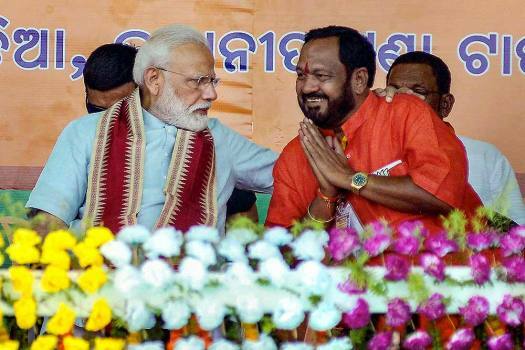 Any taint by association on account of the BJD’s membership of the NDA could be explained away by saying that the agenda and the doings of BJP satraps were the responsibility of that party alone. This was the position taken by Chandrababu Naidu, by Mayavati and by Patnaik. ...he is the son of Biju Patnaik, a buccaneering cosmopolitan whose single greatest act of derring-do was air-lifting nationalists in Muslim majority Indonesia out of Dutch captivity. He’s also the writer Gita Mehta’s brother. It’s hard to fit the ethnic cleansing of Christians into this family profile. Sounds suspiciously like a PLU rationalisation to me. They said pretty much the same about many things that Nehru's daughter and grandsons did -- or the great grandson said recently, for example. But despite the above reservations, it does make a nuanced argument and is right in suggesting that, yes, Kandhamal did perhaps play a part in Patnaik's decision. But it obviously was not so much to bring about a parting of the ways immediately. For Pataniak himself did engage in long, tortuous negotiations over seat-sharings with the BJP much after Kandhamal. It is an interesting thought experiment to ponder over just how many seats more would have ensured he stayed with the BJP. ...Whenever a national party like the BJP or Congress aligns with a regional party, the national party begins to lose in the long run. We are also beginning to see two political phenomena: diminishing anti-incumbency at the level of states, and the increased importance of performance at the state level. This is giving state-level parties even more confidence to go it alone. BJD’s walking out diminishes Advani’s authority further. The BJD can still come back to the BJP post poll. But the truth is that Advani’s reputation as a figure of conciliation and charisma has taken a beating. While Vajpayee attracted allies and confidence, even in difficult times, Advani will find it difficult to keep the flock together. The BJP is in serious crisis. But it is by no means out. It needs to hunker down. 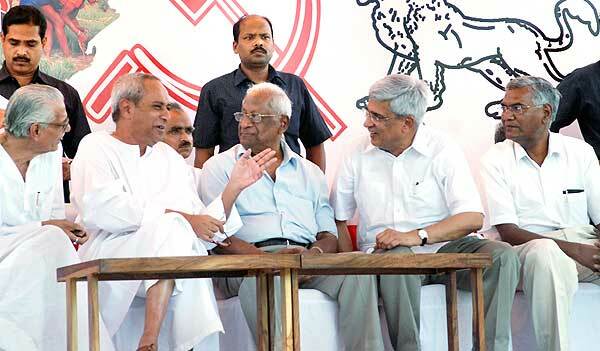 ...Patnaik was concerned that the BJP no longer had the clout to put up a meaningful fight against the Congress. He genuinely feared that an indifferent BJP performance would lead to the alliance losing its majority in the assembly. 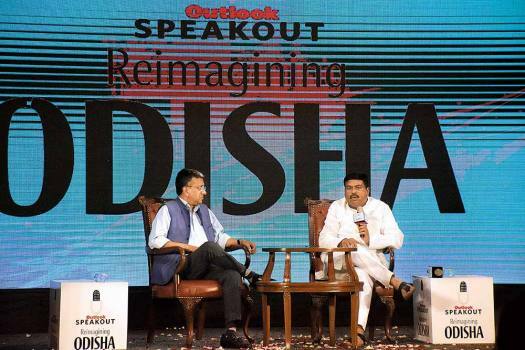 Based on the elections to local bodies, he calculated that the BJD was now the number one party in Orissa, strong enough to defeat the fractured challenge of the Congress and BJP. 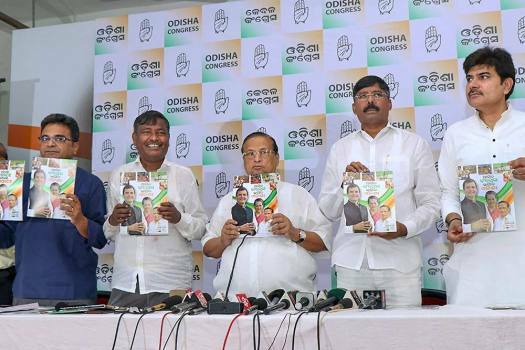 ...By showing the BJP the door, Patnaik has taken a calculated gamble. The response to his public meetings in the past three months has convinced him that the Rs 2/kg rice programme will pay handsome electoral dividends, as it did for the BJP in Chhattisgarh, and allow him to also undercut the Congress’s social constituency. 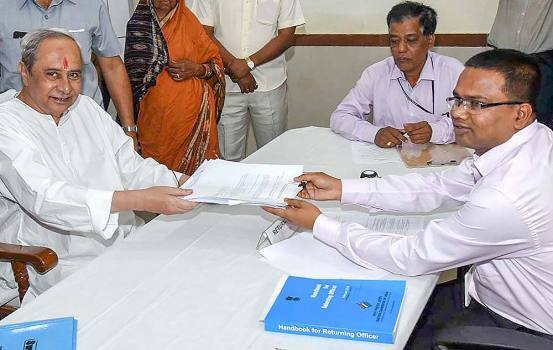 If his audacity pays off, he wins a third term and national compulsions deem it fit, he can move back to the NDA — with honour, on better terms and unencumbered by local baggage. He doesn’t belong in a rag-tag Third Front. 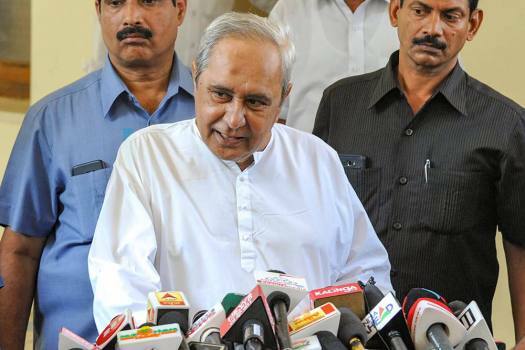 The BJP had been counting to have the backing of the majority of the 21 seats from Orissa with the help of Navin Patnaik's BJD. But with Navin Patnaik's stunning announcement last night, the BJP's campaign has received a severe setback. It is not just a loss of the majority of these seats that would hit the party, but also its psychological impact on the other allies -- such as the Shiv Sena in Maharashtra and SAD in Punjab -- with whom BJP's seat-sharing talks are already in heavy water. Leaving other calculations aside, even the following analyses by Arun Nehru, published in yesterday's Deccan Chronicle, which was clearly written before the jolt from Orissa, tells its own story. 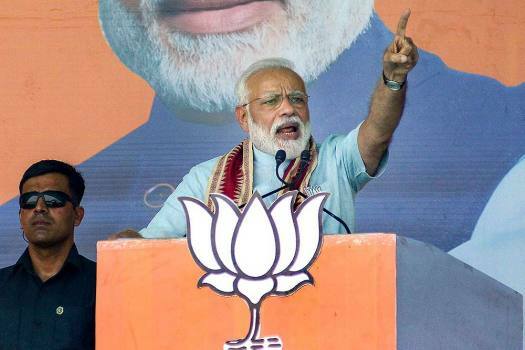 While the seat-sharing and alliance troubles are haunting the UPA and the so-called Third Front as well, at the moment, clearly, it's a big set-back for the BJP -- some say a setback big enough to have knocked the party out of the Lok Sabha race already. For Orissa, the TOI estimates gave 4 to Congress, 3 to BJP and 14 to BJD. So basically, as of now, both DNA and TOI estimates would show the BJP suffering a setback of at least 14-15 seats.